Yarmouth County, Nova Scotia, Canada is considered the place of origin of the purebred Nova Scotia Duck Tolling Retriever. 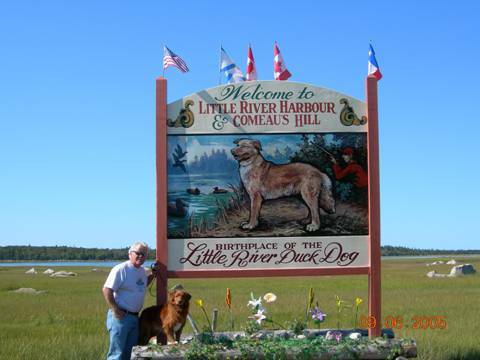 Originally known as the Little River Duck Dog, some say that the Tollers were originally to have come from Comeau’s Hill in the Little River vicinity of Yarmouth County. Jamie and Kathy visited the area in 2005 and found many of Jamie’s distant Como relatives living there. Jamie, and other North American Como’s (regardless of spelling), can trace his roots to one Comeau who settled in Nova Scotia; so too can the dogs that now run our lives be traced back to the same area of Nova Scotia. There is not authentic record of the development of the Toller, but present day thinking is that the basic stock was the red decoy dog, probably brought to Nova Scotia with the early settlers from Europe. Crosses with other breeds: possibly spaniel and setter-type dogs; retriever-type dogs; and farm collie, produced today’s Toller. The Toller has bred true for generations and was first granted official breed status by the Canadian Kennel Club in 1945, when fifteen were registered. For a number of years Tollers were seldom seen outside of Nova Scotia, but today they are spread all across Canada, the United States, as well as Europe (with many in the Scandanavian countries), Australia and New Zealand. A few Tollers were introduced into the United States in the 1960’s, but it wasn’t until the late 1970’s and early 1980’s that serious breeders became interested. The Nova Scotia Duck Tolling Retriever Club (USA) was formed in October, 1984, to promote the interest of the Toller, and to safeguard its future in the United States. The US club applied for American Kennel Club (AKC) recognition for the breed, and in March of 2001 began competing in AKC performance events (obedience, agility and tracking). Tollers were given full recognition by the AKC in July of 2003 and entered the AKC conformation ring. Now they are also eligible for AKC field trials. Tollers are referred to as “living decoys”. As hunters, we use the playful actions of our Tollers to attract ducks to swim within gunshot range. Tollers were bred to resemble a fox which can lure ducks within range. In a true hunting scenario, the tolling dog runs, jumps and plays along the shoreline as it retrieves in full view of a flock of ducks rafting in the center of the lake or flying by. Aided by the hunter who is hidden, the dog appears and disappears as a stick, bumper or a ball is thrown out into the open. The dog’s playful actions while retrieving the tolling article arouse the curiosity of the ducks swimming offshore and they are lured within gunshot range. The Toller is subsequently sent out to retrieve the dead or wounded birds shot by the hunter. We have seen our dogs toll the ducks in on several occasions. The success presumes the hunter can hit the birds, which Kathy sometimes has difficulty doing. Wow does that frustrate the dogs! Tollers can be used for upland game as well as waterfowl. They are very adaptable, and the perfect size to fit in the boat or car. Their drip-dry coat seems to shed dirt and they are generally clean dogs. Even though they are smaller than the other retrievers, they are very tenacious, and not afraid to retrieve geese or wounded birds. They are very animated when working, and will happily retrieve all day. Their enthusiasm can lead to vocalizations, but they can be trained to be quiet. If an individual Toller seems prone to vocalizations it is best to contain the “Toller scream” at a young age. The breeders who have strived so hard to protect the breed and keep the working abilities strong hope the new people drawn to the breed will be careful in their search for a breeder, and keep health and working instinct foremost on their list of requirements. While appealing in appearance and size, the Toller is not for everyone, and is happiest in an active home. See the top 10 reasons not to get a Toller at www.nsdtrc-usa.org/public_education.htm. The Toller is a medium-sized, powerful, compact, balanced, well-muscled dog. He should show a high degree of agility and determination. He was bred to retrieve in icy waters, and must have a water-repellant coat of medium length. Color is various shades of red, and white markings are allowed (but not required) on the feet, chest, tip of tail, and/or blaze. The pigment of the nose and lips is flesh-colored, or black. Ideal height (at the withers) for males over 18 months is 18-21 in (ideal is 19”); females over 18 months is 17-20 in (ideal is 18”). Weight should be in proportion to the height and bone of the dog. One of the major differences in this breed, when compared to the other retrievers, is its personality. Tollers have a spark of unique individualism. Most puppies are on the high energy side. Owners should channel this energy with regular walks and playtime. Tollers are happiest when working, and love to retrieve. The correct temperament for an adult Toller is gentleness (especially with children), intelligence, and outgoing in the field. Jamie refers to them as “wind-up dogs” since they can be so calm in the house and jump into action at the sight of a bumper or a ball. With strangers, adult Tollers may be leery at first, but there should be no sign of shyness or aggression. Tollers are very intelligent, and will work well when trained with a gentle hand. To see the full breed standard please go to http://www.nsdtrc-usa.org/toller_info.htm. Tollers are not plagued with many of the genetic health problems present in popular retriever breeds. We believe that Tollers who are part of a breeding program should go beyond having hips certified by one of the recognized agencies, and eyes cleared by a veterinary ophthalmologist. We do eye exams on an annual basis, for dogs in the breeding program; we also clear for eye problems such as PRA (progressive retinal atrophy) and CEA (collie eye anomaly) and do cardiac and thyroid clearances, as well as all of the DNA testing. Most Tollers sold in the US and Canada are sold on Non-Breeding Agreements, and must meet certain requirements before they can be used for breeding. Quality breeders are careful to make sure that dogs used for breeding are healthy and possess the qualities important in the breed. Please remember to ask to see copies of health clearances on the parents of any litter you contemplate and please go to www.toller.ca for links to an excellent site on Toller health which will help you to understand why it is necessary to ensure that the parents have had all the proper tests. Also information from the US Club can be found at http://www.nsdtrc-usa.org/h&g.htm. Please click this Magazine Article –to read about the importance in keeping the hunting instinct alive in this breed!